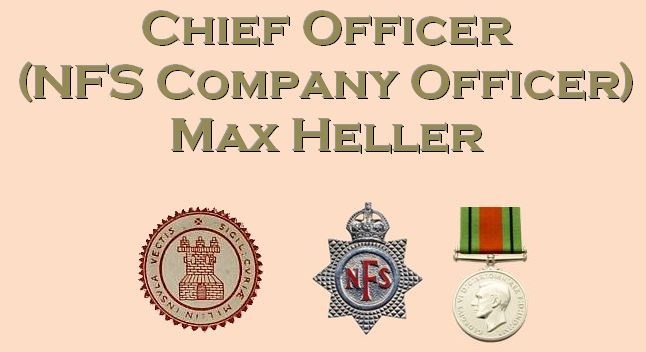 Max Heller, Company Officer of the Ryde Company of the National Fire Service and previous to that Chief Officer of Ryde Fire Brigade, passed away on 21 June 1945 aged 59. Max was only with Ryde from 1937 until just before his death eight years later but his impact as the Borough's last Chief Officer was immense as he led the town's fire-fighters through some of their toughest trials during the war. Max, full name Maximilian Wilhelm Heller, was of German descent, his parents Wilhelm and Pauline (nee Slechter) originated from Wurtemburg but were living in Dover by 1882 when their first child Edith was born. Max was the third of five children and the family census return of 1911 shows that Wilhelm had by now adopted the English 'William' and Max had shortened his name to the abbreviated version. In that same year Max joined the combined Dover Police-Fire Brigade as a constable. When WW1 came about his parents, despite being British citizens for over thirty years were treated terribly and evidence suggests they were among the many interned as enemy 'aliens'. At the same time Max was ejected from the Police force as potentially untrustworthy in an official capacity. He found work with the Navy and Army Canteen Board and ironically was hauled before the Dover Military Tribunal in June 1918 and asked to justify why he hadn't signed up for overseas service. During the war he married Dorothy Watt at River Parish Church, with the consent of her father George, a former soldier from Scotland. At the end of the war Max was keen to be reinstated in the Police force but the reaction of the Dover branch of the National Federation of Discharged and Demobilised Sailors and Soldiers stalled the process for many months and was detailed regularly in the pages of the Dover Express. The Federation finally backed down in January 1920, Heller's previously remarked upon conduct including several commendations for courageous action won their approval. For Heller it was the restart of a faultless police career and one he accompanied with a sporting prowess that often saw him appear in Press reports for all manner of disciplines but most notably as goalkeeper of Dover Harbour United until his playing days ended to be followed as a referee. 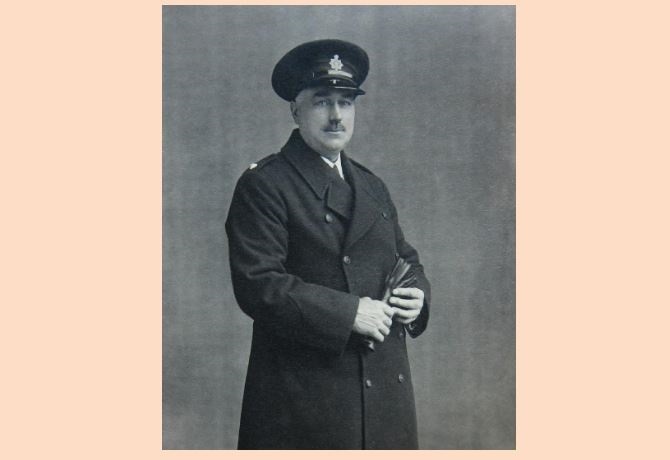 In May 1937 when Ryde's ageing (over 70) Chief Officer Jolliffe was seeing out his final months of service, Max (by now a Police Inspector) applied successfully out of four candidates for the role of Deputy Chief with the promise of immediate promotion to Chief Officer when Jolliffe retired. No sooner had he been appointed than Jolliffe suddenly died and as promised Heller was elevated to Chief. He and his family relocated to 14 Milligan Road, Ryde. His early promotion didn't phase him one bit and he threw himself into the needs of his command . Neither did he quaver when in late 1938 and the arrival of the Auxiliary Fire Service, he was suddenly in charge of a rapidly enlarging fire force compared to the eighteen members of his regular brigade. Within twelve months his workload had increased ten-fold, such was the rapid recruitment of AFS firemen, although his appeal to the Borough Council for a pay rise to reflect this increased responsibility was offhandedly dismissed. On 18 August 1941 Ryde Fire Brigade, like all pre-war brigades ceased to exist as they were absorbed alongside the AFS members in to the National Fire Service. Fire Force 14 Headquarters in Durley (Winchester) made some sweeping and indiscriminate changes at command level soon after the NFS' establishment; the highly experienced and capable Chief Officer's of Sandown and Shanklin brigades both lost their command to younger member appointed by Durley. For a spell Max was also effectively demoted to Assistant Company Officer to make way for a man of Durley's preference. In a matter of a few months however, he was upgraded to Company Officer (NFS equivalent of brigade chief officer) and continued in that role for the remainder of his command during the war. He led his brigade as a strict disciplinarian but with a warm-hearted approach to his men's lives and welfare. He was also willing to laugh at his own misfortune, such as the time when his wartime NFS firemen were providing fire cover at Cornwall slip for the pumping in-land of fuel from a vessel offshore. Realising there was insufficient foam extinguishers available he drove his car back to Station Street to collect more. As he bumped back down Union Street one of the extinguishers fell over and self-operated, by the time he returned to his firemen he was sat with foam up to his chest and spilling out of the windows... but he saw the funny side. During the war enemy bombing tested him and his men of Ryde on numerous occasions but the ultimate test, as it was for all Island firemen of the era, came on the night of 4/5 May 1942 in East Cowes where tragically two of his crew were killed by a direct hit minutes after he'd allowed them a break to grab a cuppa and sandwich from a WVS catering van. He served very nearly until VE Day but suddenly in spring 1945 suffered ill health that forced him into early retirement. On 21 June, feeling a little better, he'd been visiting former colleagues in Dover and then caught a train to London. Sadly on route he collapsed in the carriage and by the time the train had arrived at Charing Cross he'd passed away. His funeral took place at Binstead Parish Church where his coffin was born by six firemen of the NFS and attended by many including a broad raft of Island firemen and chiefs in addition to the Mayor Mr H.W.O. Weeks (father of one of Heller's deceased firemen), the committee of the IW Fire Brigades Federation and many former colleagues from Dover. Given the esteem in which he was held and the manner in which he served the town and the fire services during it's toughest tests it is surprising that his final resting place remains unmarked. It's an objective of the IWFBF to identify his resting place, where in later years he was reunited with Dorothy, and, with the blessing of any remaining family, suitably mark the grave. Rest in peace Chief Officer Heller.